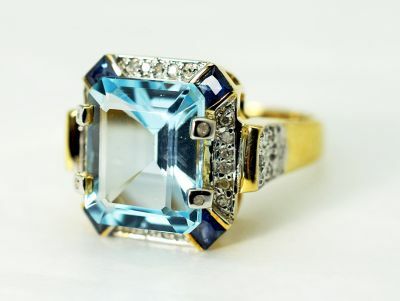 A beautiful Art Deco style 14kt yellow gold ring featuring 1 octagon cutl light sky blue topaz, est. 7.00ct; 4 square cut dark blue sapphires, est. 0.40ct and 34 single cut diamonds, est. 0.17ct (I2 clarity & H-I colour).